HomeTreasure Coast SCORE Recognizes 25-year Volunteer! 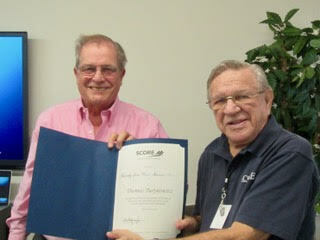 Treasure Coast SCORE Recognizes 25-year Volunteer! The Treasure Coast Chapter of SCORE recently recognized Thomas Turynowicz, a long-time SCORE volunteer, with a Twenty Five Year Service Award for appreciation and recognition of his dedication and voluntary service to SCORE and the small business community. Mr. Turynowicz signed on initially as a snowbird mentor in November, 1992, until becoming a year-round member upon moving to Florida permanently in 1996. He wore many hats during his volunteerism, including Chapter Chair and more than ten years as Assistant Director of the Southeast District SCORE in Florida. When Mr. Turynowicz joined Score in the early 1990s, the chapter was located in a little cubby hole just north of Taylor Creek in Fort Pierce, until the Small Business Administration moved the chapter to its current location on U.S. 1 in the mid-1990s. The chapter had 10 mentors and processed everything manually. The total yearly services were in the low hundreds, in contrast to the 40 mentors and total services of more than 4,000 processed annually with today’s modern equipment and technology. Mr.Turynowicz had a successful 39-year career with a National Property and Casualty Insurance Company prior to signing up with SCORE. He received a Bachelor of Science Degree from Northeastern University, Boston, MA and graduated with Honors in 1953. His education was interrupted for a year by being called back for active duty in 1950 and served with the Army in the Southeast Japanese Tactical Command Division. Anyone interested in more information about SCORE may call the Fort Pierce office at 772-489-0548, or visit its website at www.treasurecoast.score.org.